How to Work With Module Positions and Module Class Suffixes. 1. Sign in and go to Administrator >> Extensions >> Template Manager. 2. 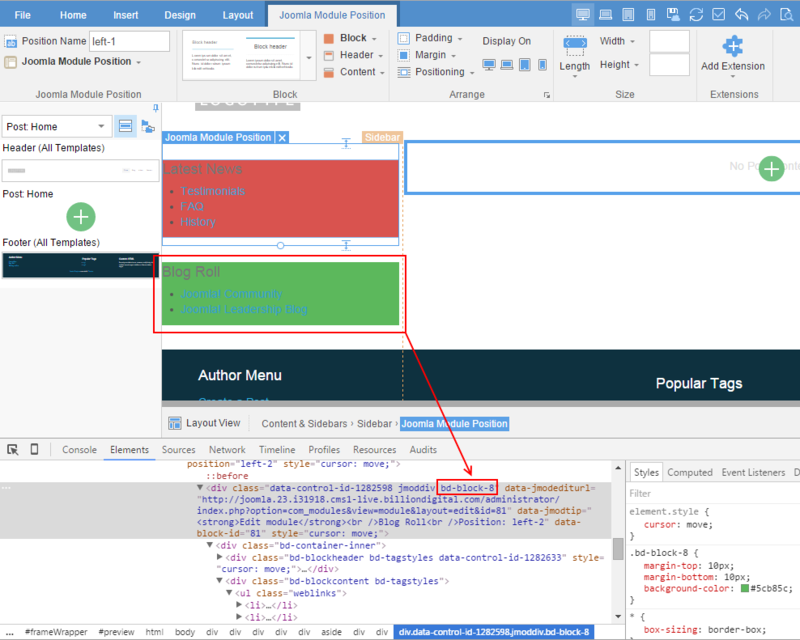 In Template Manager: Styles click <your Themler's template name>. 3. In the Details section click the "Edit Template" button. This simple operation will load Themler in the same window where you can access all Themler features for editing the current template. For your convenience, in the Preview Area you will see the real website content. 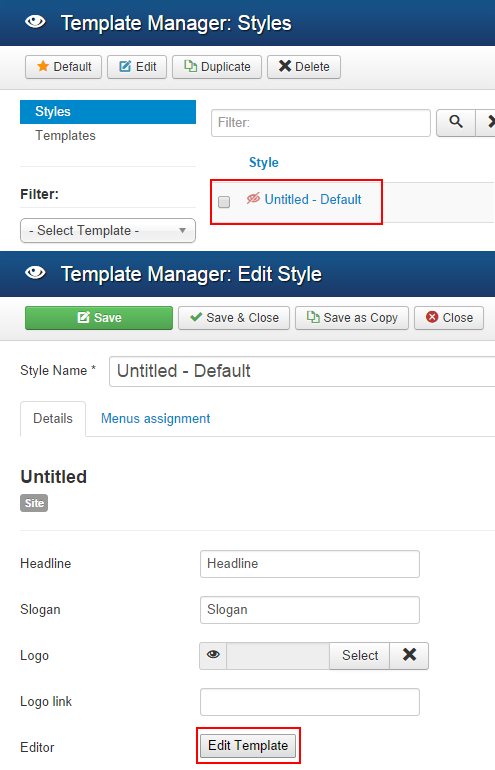 The text of the Headline and Slogan controls can be changed under the Joomla Template Manager >> Styles >> click <your Themler's template name> >> Details >> Headline and Slogan. In the "Logo Link" field you can add a custom logo link. By default, the Logo Link navigates to the website home page. Themler supports Joomla position control. This control creates Joomla position for modules. Theme can include unlimited number of Joomla positions. Once a new Joomla Position is added to the template and the changes are saved, you can add modules into this position vis Joomla Admin Panel >> Extensions >> Module manager. Unlike Artisteer themes for Joomla, Themler theme does not have predefined number of module class suffixes to stylize Joomla modules. 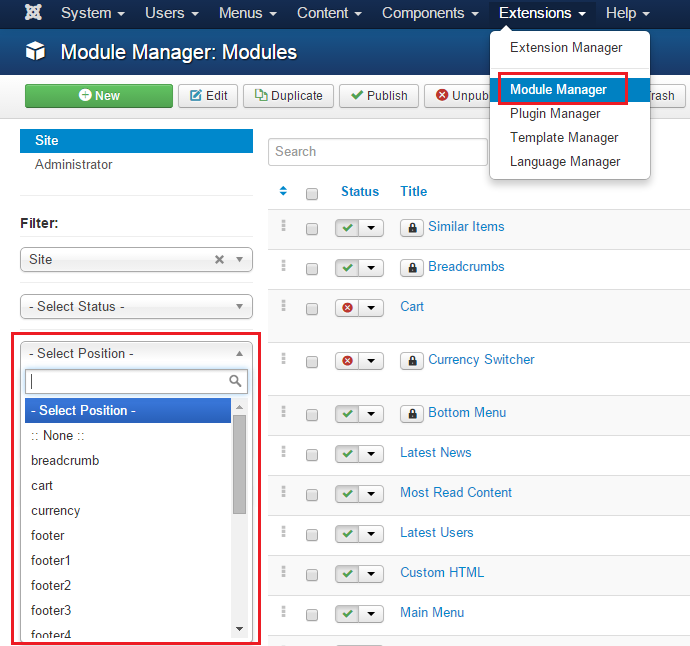 But Themler allows to create unique style for all modules in a specified joomla position. For example: Let's say, we added 2 Joomla Position controls to the template. The first Joomla position is called left-2 and the second joomla position is called left-2. All modules in left-1 position may have red background and all modules in left-2 position may have green background. Most of templates on theme stocks like themeforest work in the same way. So, all modules in left-1 position (with red background) have bd-block-7 class and all module in left-2 position (with green background) have 'bd-block-8' classes. If you add bd-block-8 class as module class suffix to the module in left-1 this module will have green background. NOTE: The module class suffix will be added to the existing class. In some cases you may achieve the combination of different styles. Therefore it's better to use the provided workaround for joomla positions where you do not have customized blocks. - [How to Edit Template](#edit) - [How to Edit Headline and Slogan](#headline) - [How to Edit Template Logo](#logo) - [How to Add Top Menu](#tmenu) - [How to Work With Module Positions and Module Class Suffixes. ](#positions) See Also: - [How to Add Horizontal Menu](page:5516) - [How to Add Vertical Menu](page:6643) <a id="edit"></a> ### How to Edit a Template To load Themler to edit a theme, please follow the next steps: 1. Sign in and go to **Administrator** >> **Extensions** >> **Template Manager**. 2. In Template Manager: **Styles** click **&lt;your Themler's template name&gt;**. 3. In the Details section click the **"Edit Template"** button. !joomla-admin.png! This simple operation will load Themler in the same window where you can access all Themler features for editing the current template. For your convenience, in the Preview Area you will see the real website content. 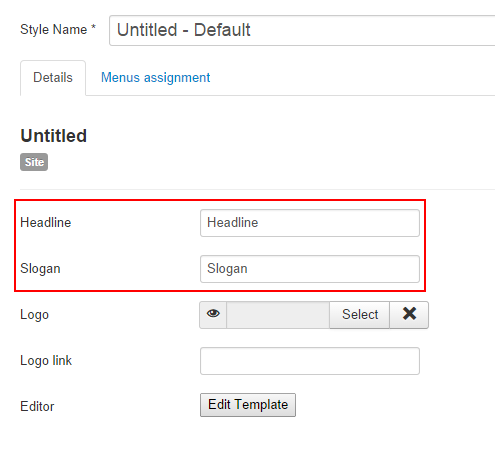 <a id="headline"></a> ###How to Edit Headline and Slogan The text of the Headline and Slogan controls can be changed under the Joomla **Template Manager** >> **Styles** >> click **&lt;your Themler's template name&gt;** >> **Details** >> Headline and Slogan. <img src="http://attachments.answers.billiondigital.com/674/674/headline-slogan.png" width="385"> <a id="logo"></a> ###How to Edit Template Logo To add a logo to the template you should add Logo control in Themler. The Logo image added in Themler can be changed via the Joomla **Template Manager** >> **Styles** >> click **&lt;your Themler's template name&gt;** >> **Details** >> **Logo**: <img src="http://attachments.answers.billiondigital.com/675/675/logo-link.png" width="385"> In the "Logo Link" field you can add a custom logo link. By default, the Logo Link navigates to the website home page. <a id="hmenu"></a> ###How to Add a Horizontal Menu [How to Create Horizontal Menus in Joomla](page:5516) <a id="vmenu"></a> ###How to Add a Vertical Menu [How to Create Vertical Menus in Joomla](page:6643) <a id="tmenu"></a> ###How to Add a Top Menu <a id="positions"></a> ###How to work with Module Positions and Module Class Suffixes. Themler supports [Joomla position](page:4762) control. This control creates Joomla position for modules. Theme can include unlimited number of *Joomla positions*. Once a new *Joomla Position* is added to the template and the changes are saved, you can add modules into this position vis Joomla **Admin Panel** >> **Extensions** >> **Module manager**. 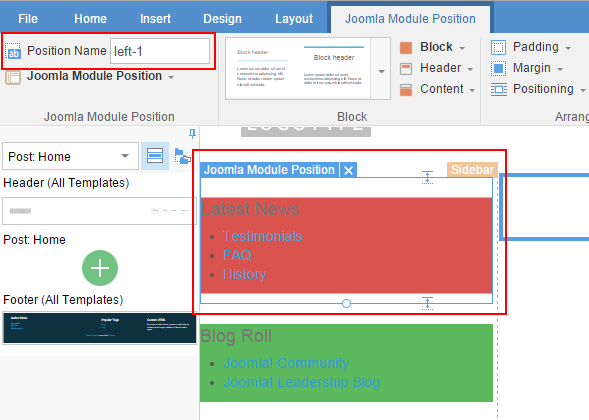 <img src="http://attachments.answers.billiondigital.com/558/1558/JoomlaAdminPosition.png" alt="joomla module manager"> Unlike Artisteer themes for Joomla, Themler theme does not have predefined number of module class suffixes to stylize Joomla modules. But Themler allows to create unique style for all modules in a specified joomla position. For example: Let's say, we added 2 *Joomla Position* controls to the template. The first Joomla position is called *left-2* and the second joomla position is called *left-2*. All modules in *left-1* position may have red background and all modules in *left-2* position may have green background. Most of templates on theme stocks like themeforest work in the same way. !joomla-position-left.png! If you need to assign green background to module in the *left-1* the module class suffix can be used still. Themler uses *Block* control to stylize modules. Each block with default style (from Design Tab >> Styles) has the same class `bd-block`. If you change the style of the Blocks in the specific joomla position this class will be changed too. For example: !bd-block-class.png! So, all modules in *left-1* position (with red background) have `bd-block-7` class and all module in *left-2* position (with green background) have 'bd-block-8' classes. If you add `bd-block-8` class as module class suffix to the module in *left-1* this module will have green background. **NOTE:** The module class suffix will be added to the existing class. In some cases you may achieve the combination of different styles. Therefore it's better to use the provided workaround for joomla positions where you do not have customized blocks.